Thought there would be an interest in how things went at the Cabinet Meeting. 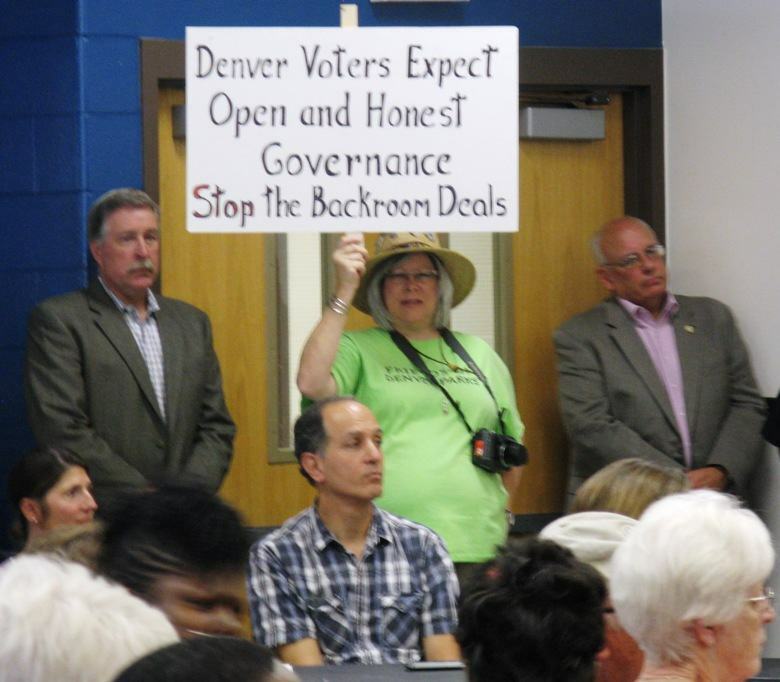 We had great group of folks show up and hold signs, also many known supporters in the audience. It was so nice to see everyone’s smiling faces again. Joe’s new sign was the best. Joe was a bit naughty and let Deborah Johnson Clerk and Recorder know how he felt about her not seeking independent counsel before denying us the right to vote. .
We got a lot of questions from people who were curious about the green t-shirts and signs. We were able to do education on many fronts. I did get the chance to speak with many of the politicians involved. Scott Gilmore again gleefully informed me that he will be killing the prairie dog colony. Of course, our conversation was not entirely cordial. Not sure I’m so keen on our Parks and Recreation Dept leadership. The Mayor told me that” we have the correct legal position” (referring to city government). I told him that this situation could very well show up at the ballot box. He did seem to hear what I said. It is surprising how some people will hold tightly onto an anchor rope even when they are told that the ship is sinking. Even when it would be a better decision to let go and swim away from a lost cause. Well,at least I tried to tell him. Also I heard that many of the city worker bees thought we had lost the case. One of them on the Mayors Cabinet. Wow! Wonder who spread that lie. I made sure that they understood that our lawsuit has not been heard in court yet, and we have appeal rights too! We were treated with the utmost respect and no one attempted to impede our right to protest. We also remained respectful. There was a substantial law enforcement presence, but I did not feel threatened in anyway and most of the officers were there to speak about neighborhood issues. All in all, our presence at this Cabinet Meeting was important and meaningful. We received many encouragements by thumbs up and thank you’s from community members as they walked by us holding our signs. I think it is very important that we keep this issue in the public eye in order to keep up the pressure on this situation. I believe we did make a substantial impact in this area. In the meantime, be looking for a very important public announcement from Friends of Denver Parks in the next day or two!!! Real Life and Real People is the most fun. This entry was posted in Hentzell Park Update and tagged Debra Johnson, Denver Charter, Denver Parks and Recreation, Denver Public Schools, Hampton Heights North Park, Renee Lewis. Bookmark the permalink.